There’s no denying the fact that there’s a lot of content on the web, and inevitably at least some of it is going to be similar to content elsewhere. But there’s a world of difference between similar content and duplicate content. 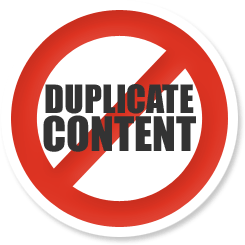 In this special post we ask the question, what is duplicate content? Why is it bad for your online marketing strategy? We’ll also focus in on a host of related issues that can come into play. It’s important to realise that there is no distinction between these types of duplicate content as far as the search engines are concerned, and just because you didn’t mean to do it doesn’t mean you’ll be let off scot free. We’ll look at additional reasons why duplicate content should be avoided in a moment, but for now let’s focus in on the repercussions as far as search engine optimisation is concerned. Google and all of the other search engines are at all times doing their best to answer their users’ queries with results which are the most relevant and useful. They do this, in simple terms, by scouring the internet for web pages that fit this bill. If a page on your site is a duplicate of another elsewhere on the internet or on your own site it is deemed to have far less value than content that is original. In this way, a competitor with inferior products or services to yours could do far better than you online, simply by virtue of having original content. In practical terms, Google and most other search engines will not index duplicate content. That means that for search engine optimisation (SEO) purposes these pages will be worthless – they will not help you rank more highly for users queries, but more importantly, they will simply not show up in searches. Furthermore, if Google believes that you have acted deliberately in an attempt to influence its rankings, it may apply a ranking penalty or remove your site from its index entirely. Aside from these pressing SEO matters, having duplicate content will also do your brand presence little good. The most effective content is that which is tailored specifically to your brand’s tone of voice and to your customers. Your content should be highly original and should be distinctively recognisable as yours – it should have a vibrant personality all of its very own. Duplicate content is not memorable and it will not help you to stand out. It will instead result in you being seen as just another generic carbon copy brand with nothing fresh to say or offer. As with all forms of written and artistic content, the copyright of a piece of online content is automatically assigned to its author (or to the party to which the copyright has been handed over to in the case of copywriting and ghostwriting). If you ‘borrow’ (read: ‘steal’) content from someone else without their consent then you are in breach of copyright laws and may be liable to a lawsuit. Though such cases are seldom enforced at the moment, it’s something to keep in mind, particularly with the potential for one landmark lawsuit to open the floodgates to more. As we mentioned earlier, the search engines have a vested interest in keeping duplicate content out of their results. To this end they are constantly fine-tuning their search algorithms to detect and remove such content. Google is by far the most visible and vocal search engine in this regard, and has released a number of animal-themed updates over the past few years to tackle the issue of duplicate content. Google Panda was first unleashed upon the world in 2011. Its primary purpose was to weed out low quality sites from the results, particularly ‘scraper sites’ which exclusively published copied content. There have since been numerous reissues of the update, the most recent being 4.1, which aimed to further penalise ‘thin’ content. 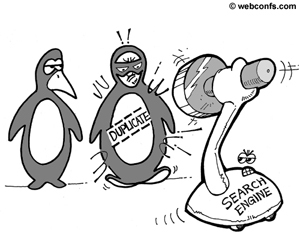 Google Penguin was released in April 2012, with the aim of penalising sites which use ‘black hat’ tactics in contravention of Google’s Webmaster Guidelines. Amongst these tactics is the use of duplicate content. Google Hummingbird, released in 2013, may not deal specifically with duplicate content. But it did substantially change the way that Google deals with user queries, injecting a semantic element aimed at ‘understanding’ the query, rather than just matching the words. To do well in this new online world, you need original content which is tailored specifically to your site. 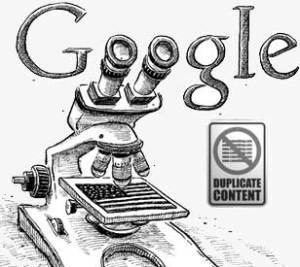 What does Google currently say about Duplicate content? If you’re concerned about the presence of duplicate content on your website, there’s no need to fret, but it is something that you should take care of at the earliest possible instance. Failure to do so may hamper your online marketing efforts significantly, and hold your business back from reaching its full potential. Replace – This bit is relatively simple but can be time consuming, so many businesses outsource it to a professional web copywriter or copywriting agency. In place of duplicate content, you should create exceptional content which is relevant to your offerings, specific to your brand and aimed directly at your customers. Check for plagiarism of your own content – At present, Google does not distinguish between the original creator of the content and its copiers. This means that if people copy your content, it may well be your page which doesn’t get indexed. Unfair of course, but in practical terms it pays to be proactive in checking to see if anyone has helped themselves to your content. You can do so relatively quickly and easily with tools like the ones mentioned above, as well as Plagiarism Checker and Article Checker. Should you identify any duplicates, you might consider contacting the offending party to request its removal, along with a firm reminder of copyright law and the potential consequences of unauthorised copying. Hopefully we’ve helped you to better understand why duplicate content really does mean bad news for your website and you feel energised to do something about it. Doing so will help you build a healthy online presence and a memorable brand, and can of course improve your position in the search rankings no end. If you need any help in identifying duplicate content or creating lively new original content that really sells, don’t hesitate to get in touch with Big Star Copywriting.